Systec's Load Centering Device (LCD) is a very effective method for automatic load centering. The LCD is offered in many widths to accommodate various load sizes. It can be set in Powered Accumulating Roller conveyor (PAR), Powered Roller Only conveyor (PRO), or Gravity Roller Conveyor (GRC). 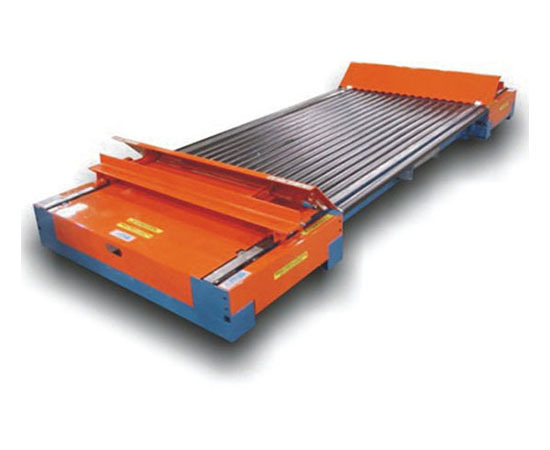 Fold-up heads or the optional fixed heads for pallet centering or squaring. An adjustable variable frequency drive senses the pressure applied and when the load is sensed to be centered, it then reverses the heads to the home position.